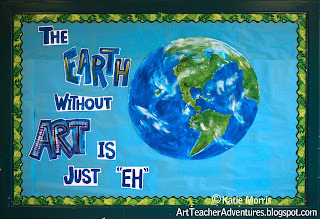 Adventures of an Art Teacher: The Earth Without Art is Just "Eh"
This was going to be my Earth Day bulletin board. We had a visiting author/illustrator (more about that later) in April so the timing worked out that I decorated for that instead. 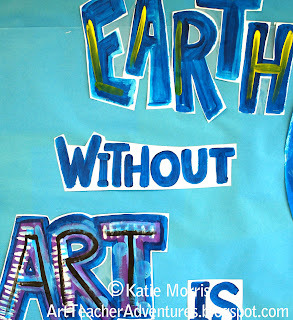 Anyway, I'm sure you've all see "The Earth Without Art is Just 'Eh'" somewhere recently. I think I pinned an image of it last fall so I could remember the right wording for a bulletin board. Some of the kids don't get it until I read it to them. 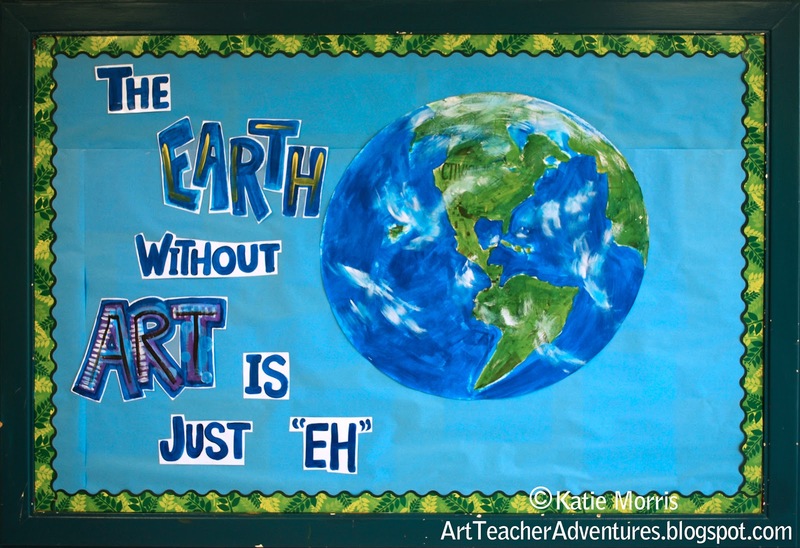 They don't know that "eh" means so-so, just ok.
Can you believe I actually covered my bulletin board background? I only did it because I got two designs out of one covering. The light blue was the background for the author visit and I took down the other decorations before the sunlight faded the paper around them. I even have a fancy schmancy coordinating leaf border. Earth was made by tracing a gigantic (slightly lopsided) hula hoop I borrowed from our PE teacher on 2 pieces of pieced together poster board. 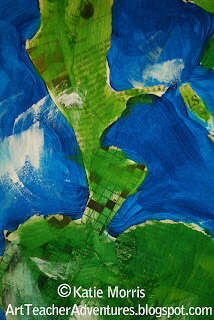 I looked at a satellite image of Earth and painted the water (negative space) around the continents first. I tore newspaper and overlapped the pieces to form the shape of the continents then painted over with green, letting the print show through. It didn't look quite right so I added some cloud cover. I like to make my own letters when I can. I like the look better than die-cut letters and it's usually faster for me than counting how many copies I need of each letter. It would have looked cool to paint directly onto the butcher paper background, but by painting my letters on paper, cutting, and laminating them, I'll be able to use them again and again without losing quality. When I get lazy, I don't trim as much around words that are less important. I like this project! I nice to discover the word "art" in Earth! Love this. 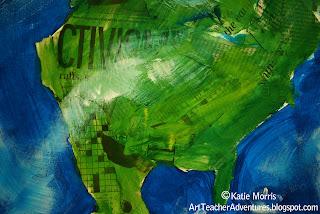 Gonna use this for "Art Around the World"
This is so Great! Thanx!